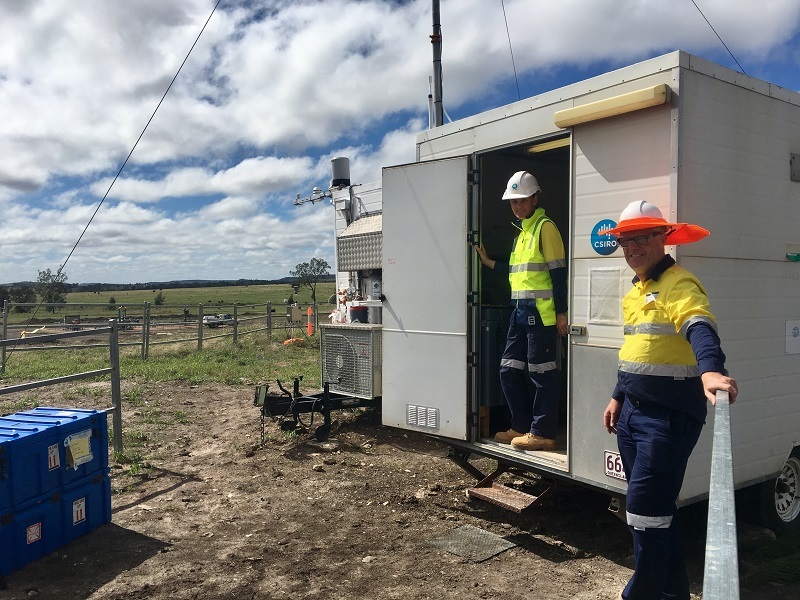 Erin Dunne (left), a Postdoctoral Fellow with Oceans and Atmosphere, is pictured with Scott Henson at an air monitoring site in the coal seam gas field near Roma in Queensland. Water, earth and air are the focus of a new campaign to investigate the potential impact of hydraulic fracturing on coal seam gas (CSG) wells. Our researchers have spent months at a gas field site near Roma, central Queensland, as part of a comprehensive monitoring campaign to measure the air, surface water, groundwater and soil impacts of hydraulic fracturing which is used to stimulate gas production from CSG wells in the Surat Basin. Atmospheric, soil and water scientists are undertaking the research through the Gas Industry Social and Environmental Research Alliance in response to community questions about the environmental and health risks of hydraulic fracturing. We established a series of live air quality monitoring stations near the wells in July 2017. Since then, we have been taking soil and water samples to capture data from the wells before, during and after the fracturing. Erin Dunne from our Climate Science Centre says the air quality component of the project is one of the most comprehensive studies ever undertaken in Australia. It involves measuring air pollutant levels that occur during hydraulic fracturing, and providing information on the potential sources of air pollutants. It also compares air quality with state and federal air quality guidelines and other studies from around Australia. Meanwhile, our Land and Water scientists are busy analysing 100 water samples and more than 40 soil samples to determine the concentration of more than 150 potential contaminants, including both inorganic and organic chemicals. Given the unpredictable nature of spills, a laboratory scenario study will expose soil samples representative of different soil types across the region – from hydraulic fracturing fluids to flowback waters. The degradation and stability of the added contaminants over time will then be measured. Through GISERA’s Knowledge Transfer Sessions, we will share our research outcomes with government, industry and the community. The research will potentially inform policy development and improve industry practice, as well as provide communities in gas production areas with a better picture of the air, water and soil quality around hydraulic fracturing activities in coal seam gas sites. Results of the research are expected at the end of 2018. Watch our scientists at work measuring the air, water and soil to better understand potential impacts of hydraulic fracturing in coal seam gas production. Measurements have been made before fracturing, which is mentioned in the article. It seems strange that no mention is made in this article of baseline measurements done before fracking is done. Without this information surely this study will be called into question.